There are some petitions planned directly to the German Parliament (“Bundestag”) that’ll need international support. These are NOT the run-of-the-mill online petitions. They really have the potential to move something. Any petition that reaches the threshold of 50000 signatures within a month gets a chance to be presented personally in a open session of the Parliament. 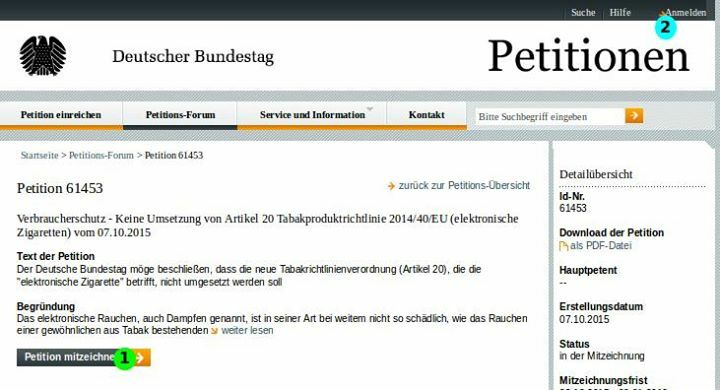 Unfortunately the chances of getting that much support from German vapers alone is a pipe dream.Fortunately, EVERYBODY may support such a petition. Actually, getting a lot of international support could cause quite a stir by itself, since that usually doesn’t happen. So, even if we don’t manage to jump that hurdle, chances are good that the politicians may finally notice that there is more to vaping than what the local ANTZ and their cronies tell them.This is the official site of the government. You need to register once before supporting parliamental petitions. After that supporting is just one click after logging in. They insist on real personal data. And more than the usual online petition. Fake data would only cause harm if found out. So, please, don’t be too creative here. This registration is a prerequisite for supporting petitions. 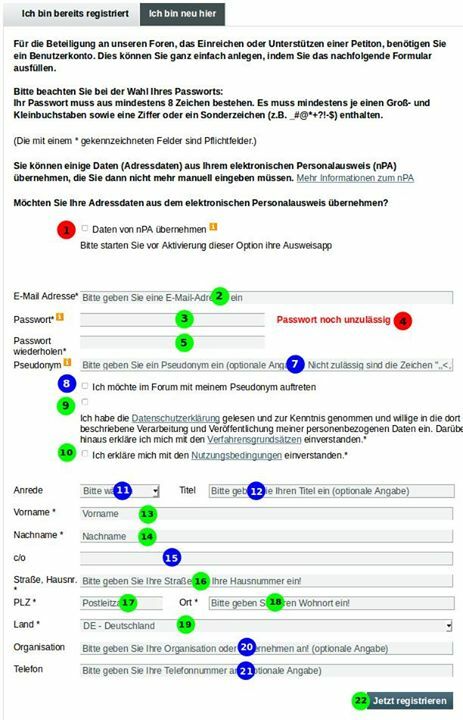 How to register to sign petitions at the official German Parliament (Bundestag) site. 1. Don’t check this. This is only for german electronic id cards. 4. int that the password isn’t acceptable yet. 7. Optional: Your nickname. you can only choose it once. No changing later. Your real name is never shown publicly. It’s either your nick or a generated numbered id that is shown. 8. Optional: Check this if you want (optional) posts in the forum to be signed with your nick (7). Unchecked they’ll use that generated id. If I remember correctly you’ll then get a mail with a link to confirm you registration. If you want to translate this to other languages, you’re welcome to use this screen shot. Please leave a link to your translation in the comments. or post it as comment, too. 1. “Petition mitzeichnen” means: “Sign Petition”. Click here to do it. – If you aren’t logged in, this will take you to the login screen. – If you already are logged in this is all you need to do to sign. – If it says “Mitzeichnung entfernen”, then you already have signed this petition and clicking here will remove your signature again. 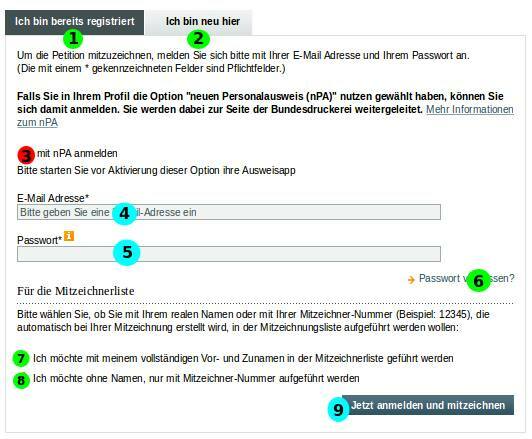 2. optional “Anmelden” means “login”. This button is on every page. It also takes you to a slightly different login screen. When it says “Abmelden” it means you already are logged in and you may log out here. This is the screen you usually stay on, if you already have registered once. 2. “Ich bin neu hier” means: “I’m new here”. Click here if you haven’t registered yet. It will take you to the registration screen. 3. Don’t check this. It’s only for Germans with a new electronic ID card and a reader. 4. Enter the email address you gave during the registration. You may click here if you forgotten your password. You’ll get some mail. 9. “Jetzt anmelden und mitzeichnen” means: “Log in now and sign the petition”. When all else is filled, click here and you’re done. All German Vapors will say Thank You to all British Friends. We need the international Power. We all must stand united or slowly but surely they will divide and conquer. Well, I’ve done my ‘duty’ and registered and signed. Rather hard work compared to some petitions but hopefully worth it. DID notice after I’d signed that it looks as though well over 15,000 people have already signed up so my fingers are firmly crossed that this WILL actually work and maybe even lead to a result!! Mostly just wanted to encourage other Brits to battle through all the instructions and sign up as well, plus say ‘thanks’ for giving such good instructions about which bits you need to fill in – I don’t think I’d have managed without the help. Well done for promoting this and Happy New Year to all involved. Well Wendy i just did it thankfully they gave precise directions, being from U.S of A I don’t read any German. But we need to help our fellow vapors. When i signed up i was the 33386 person on the list. Well done, Michael – and in fact everyone else who has signed whether they found it easy to do or not!! I asked to get notification every time someone else comments here, and it looks a bit like this is beginning to snowball/trend or whatever the current buzzphrase is – at last! This gives me real hope that the 50,000 target might be reached. Just in case some of the recent signatories who’ve come along are active in forums in the US or wherever, can I ask that you go back and post there AGAIN to encourage yet more people to sign up too? OK, it ISN’T easy if you don’t speak German but it IS possible so please keep trying till it works, guys. This is real people power in action and it’s really doing my heart good to see this. Shared with the romanian vapers community. Vape on brothers! We are signing it al over Europe. I’m from Romania and the vaping community is signing it here too. e-cig is good for people, but no good for tobacco company, that’s the government’s duty to protect the people, not the companies. A little help from Portugal. Hope that the Germans reach the 50k signatures.
. Me along with many others. I signed it too. Though I’m an American, I visit Germany every year or so (most recently for 10 days in November). I was surprised that I didn’t see even one ecig, even during ‘smoke breaks’ at shows in Berlin and Hamburg. Vapors unite! One signature from Wisconsin, United States. Jump in everyone! Got it, Good luck, Germany! I am Mark Christopher Reutens here from Malaysia, World Vapers Unite against BTC, it it time we got back what was rightfully ours instead of being manipulated at all times. Signed and hope it helps! Done! Richmond, Virginia (CASAA member). Cheers to vapers world round! You must click on the email they send you to be able to sign the petition. CHECK YOUR SPAM FOLDER! Since most people in the US or most countries other than Germany don’t get email in German, it makes sense for gmail (or most providers) to assume it’s spam. Pick up the pace people I was only #34586. 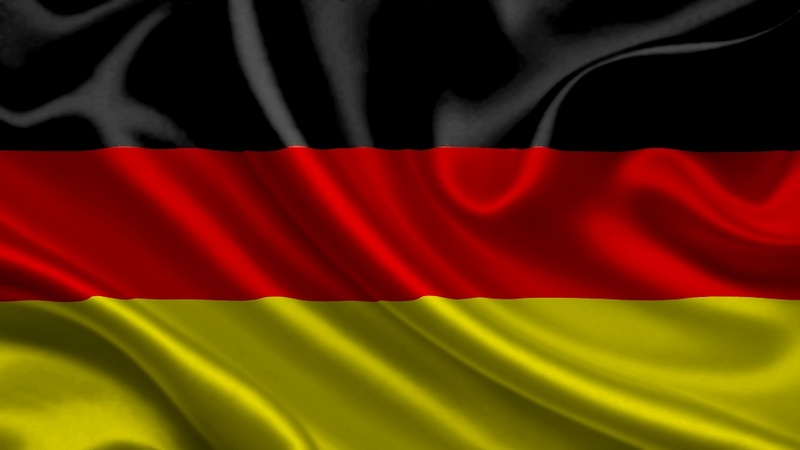 Good Luck from Indonesia, All vapers unite we can do this germany!! Hoping the signatures continue to grow for the cause. Much love from Detroit, keep on vaping. After you signed, you’ll get an e-mail with a confirmation-link. to confirm your signing, otherwise it won’t count. I wanted to sigh this but I don’t know german . I tried and tried with out no success. I did not understand the petition and could not find the English version. Just a thought….use Chrome if you can, I did. It helped translate the page, while following the instructions above. This is good, a united WORLD front. From Texas, U.S., I stand beside you. Good luck guys. You’ll be in my thoughts as we fight this fight. almost as if certain Governments are bought by certain corporations, in this case the Tobbacco corporations. Greetings and Support from Broken Arrow, Oklahoma, U.S.A. Mine makes it 36,617 Hope you make it! Done, support coming from Michigan. Hope everything turns out! I’ve always wanted to visit Germany. Hope the 50,000 is reached. I just signed – # 38,494! I hope I did this successfully. I saw my name listed and the number beside it was 41276. We don’t get much traffic but we’re helping! 5 Pings/Trackbacks for "Petition to the German Parliament"